Our business has a strong brand, but over the the last few years the brand has been in decline across the various sites which act as individual cost centres. The business has focussed on cost reduction to keep it afloat and has been managed for cash while sales have been declining. Last year we were unable to reduce our cost sufficiently and for the first time made a loss. As a result, there has been a change of leadership who have implemented a re-brand and we are now seeing sales increase. We are now trying to implement an opex system to help deliver value to the customer and ensure we retain efficiency as we grow. The problem is we are finding it difficult to get the opex system to work as the culture is still one of cost saving, not growth. 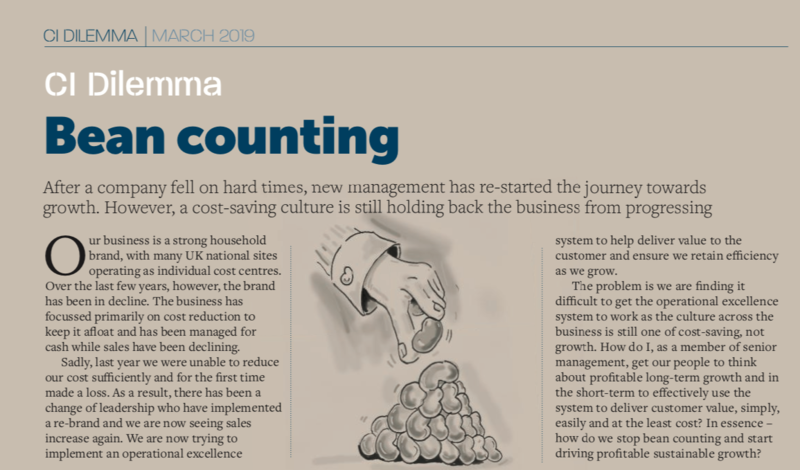 How do I get our people to think about profitable long-term growth and in the short-term to effectively use the system to deliver customer value, simply, easily and at least cost? Rather than a one-size fits all approach to cultural change, this organisation, due to its model and scale, needs to see change as a journey of constituent parts. Clearly there is a pressing need to breathe life into each cost centre in order to allow each one to unlock their individual opportunities under the corporate growth umbrella. Operational excellence transformation requires culture change to be successful. To accelerate and sustain change, significant focus must be placed upon the strategic framework, a group-wide toolbox, enabling behaviours and strong programme management. Grow – reliable and efficient end to end processes that increase competitiveness and free up time to focus on customer satisfaction and business growth. Using the Suiko WHY (results), WHAT (tools and behaviours), HOW (ability to change) assessments we start by assessing the level maturity of each business unit. This allows middle management to understand the gaps and develop an improvement plan with the site teams. In this way this important layer of management is swiftly bought into the process. As linchpins within cultural hierarchy of the organisation, they have access to shop-floor staff and the senior management above them. This is often a difficult tier to influence, engage and empower successfully, but once on board, results and practices can be embedded efficiently. 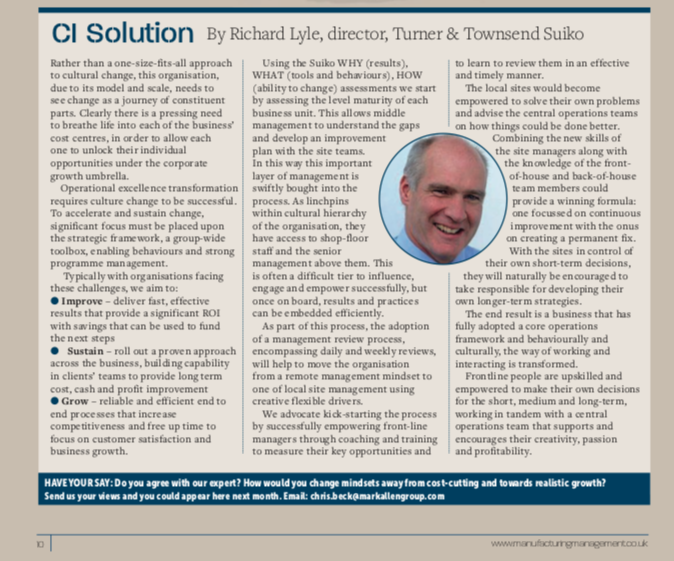 As part of this process, the adoption of a management review process, encompassing daily and weekly reviews helps to move the organisation from remote management to local site management using creative flexible drivers. We advocate kick-starting the process by successfully empowering front-line managers through coaching and training to measure their key opportunities and to learn to review them in an effective and timely manner. The local sites would become empowered to solve their own problems and advise the central operations teams on how things could be done better. Combining the new skills of the site managers along with the knowledge of the front of house and back of house team members could provide a winning formula focussed on continuous improvement with the onus on creating a permanent fix. With the sites in control of their own short-term decisions, they will naturally be encouraged to take responsible for developing their own longer-term strategies. The end result is a business that has fully adopted a core operations framework and behaviourally and culturally, the way of working and interacting is transformed. Frontline people are upskilled and empowered to make their own decisions for the short, medium and long-term, working in tandem with a central operations team that supports and encourages their creativity, passion and profitability.